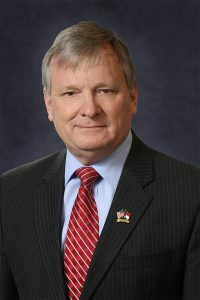 As former Speaker Pro Tempore and NC Assistant Secretary of Commerce, Dale Folwell has experience in solving problems for the citizens of North Carolina. He served four terms in the N.C. House of Representatives. While in the House, Mr. Folwell authored 29 major pieces of legislation that saved money, minds, and lives for North Carolinians. Three years ago as assistant secretary of commerce, he inherited the most “broke and broken” unemployment system in the United States. Under Mr. Folwell’s leadership and with help from the General Assembly, North Carolina employers and hard-working employees, the state was able to pay-off $2.7 billion in unemployment debt and build a $1 billion surplus in 30 months. In November 2016, Mr. Folwell was elected North Carolina’s 28th State Treasurer. The North Carolina State Treasurer is responsible for the state’s pension and healthcare plans valued at more than $100 billion. Treasurer Folwell has promised the people of North Carolina that he is going show them where their money is, who is managing it and how good they are at their jobs. Treasurer Folwell began his career as a blue collar worker making a living with his hands and his back. Working his way through school, he received his B.S. and Masters in Accounting from UNC-Greensboro. He is a former vice-president and registered investment advisor for Alex Brown. A Certified Public Accountant (CPA), Treasurer Folwell also served for eight years on the Forsyth Board of Education. Married for 28 years, he and his wife Synthia have three children and live in Winston-Salem.